We have EGG-citing news! 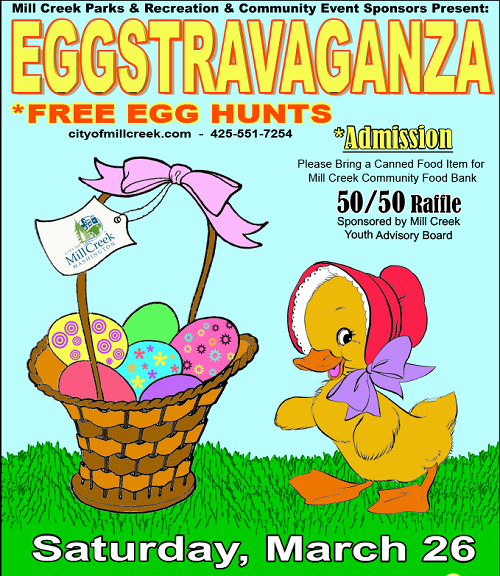 The Mill Creek Parks and Recreation Eggstravaganza is coming and you are invited. Nancy's Noah's Ark is a proud sponsor of this event. We hope all of you can make it this Saturday, March 26th to Heatherwood Middle School for some Easter fun! Then festivities begin at 10:30am and the hunts start at 11am (1yr - 4yr olds) and 11:30am (Kindergarten - 5th graders). Admission and the hunts are free, but Mill Creek Parks and Rec requests that your bring a non-perishable food item for donation. It should be hopping good time! There are currently no comments for Mill Creek Eggstravaganza 2016.